The Cubes and Liquids assessment activity is inspired by the work of a high school teacher in Troy, New York. It has been a stalwart feature in our struggle to find effective illustrations of non-destructive educational practices. In response to requests from teachers and educational institutions, and after a period of research and development, we are offering several ways to obtain sets of cubes we use in this activity. Completed sets are available for sale from this website as well as downloadable instructions allowing those with the facility to create their own sets. What are the benefits of one of our sets? ACASE’s Cubes and Liquids sets are carefully made to be able to easily and safely demonstrate the density of solids and liquids. The larger 200g cube sinks in 95% Isopropyl alcohol solution, yet is bouyant enough to float in tap water. The larger “mystery” cube will sink in tap water but will float in a saturated solution of salt water. The smaller 200g cube is used as a reference to compare to the larger cube of the same mass. The 6cm cubes can be distinguished from one another with careful handling. 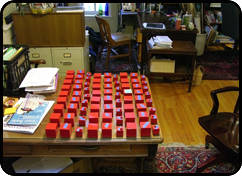 All of the cubes allow for simple density calculations, requiring minimal measurement and weighing. 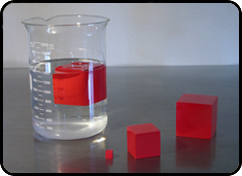 The 1cm cube further simplifies density calculations performed by students and provides a baseline for attaining understanding of the scientific designation of density or specific gravity. In addition to selling premade sets of cubes, ACASE encourages the development of cube sets by both teachers and students. 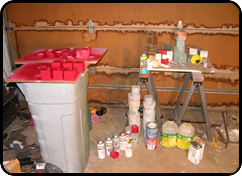 Depending on your desire for accuracy in the end product, the trial and error approach to making desnity cube sets can be quite messy and costly. To help you avoid a similar situation to the one displayed in the photograph below, we are happy to provide you with a set of instrucitons detailing our method for the manufacture of cube sets. Instructions can be downloaded here.